The author assesses the National Flood Insurance program. Incentives created by the insurance end of the program do not always coincide with the program’s intended goals. Her investigation poses questions of importance to jurisdictions enrolled or considering enrollment in NFIP. The author evaluates the prospects of future hurricanes along the Carolina coast and actions taken to protect life, property, and the environment. More comprehensive recommendations are made which includes not only a warning, evacuation, and relief activities but preventative measures like building design criteria and land use controls. The author examines the history of the battle between the Airport authority and impacted citizen and business interests over the expansion. 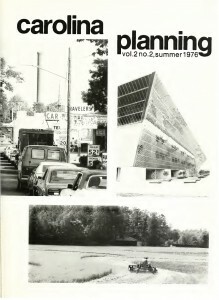 The author believes that alternative plans are worthy of consideration. The author traces the history behind Guilford County’s effort to develop a broad-based citizen participation program. The article assesses the major effects superfarms are likely to have on coastal area’s sensitive ecosystem and compares these impacts with those of alternative uses. The author reviews the theoretical arguments favoring site-value taxation and empirically investigates the effect a change from property tax to site-value taxation would have on various land uses in two North Carolina urban centers and their counties.